A group of sun-worshippers stood out from the bikini-clad crowd on this popular Athens beach. A small band of pagan revivalists dressed in white chose the 2,500-year-old temple of Apollo in Vouliagmeni, a coastal resort some 25 kilometers south of Athens, to celebrate the summer solstice in antique style Thursday. High priestess Doreta Peppa burned incense and poured libations of wine to Apollo, ancient god of the sun and music, as beachgoers a few yards away sheltered under umbrellas from temperatures of up to 39 Celsius (102 Fahrenheit). "We thank you, O Sun ... your light will once again illuminate this world, renewing the seasons," she intoned, holding a bunch of bay leaves - sacred to the ancient god. Other worshippers read hymns to Apollo, his sister Artemis - goddess of nature and hunting - their mother Leto and other ancient deities, standing inside the foundations of the limestone temple, built around 500 B.C. The 15-minute ceremony was organized by Ellinais, an Athens-based group that is campaigning to revive religious practices from the era when the 12 gods of Mt. 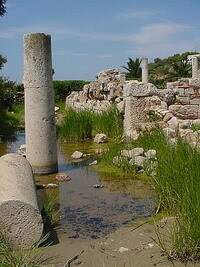 Olympus and dozens of lesser deities were worshipped in Greece. "These ceremonies are intended to waken humankind to what they are doing to themselves and to nature," Peppa said. The group counts about 100 members, while at least another four such organizations exist in the country. In January, Ellinais used the 2nd century A.D. temple of Zeus in Athens to stage the first known ceremony of the kind since the ancient Greek religion was outlawed by the Roman empire in the late 4th century. Another three ceremonies have been held since at other ancient sites, Peppa said, one of which was stopped by state archaeologists who refuse permits for such activities. But Thursday's, marking the longest day in the year, was uninterrupted - perhaps because access to the unfenced temple within the closed-off paying beach is free. "At last, we managed to conduct a ceremony in peace," Peppa said. "I felt great, because when there is no pressure the result is always better." Fearful of official intervention, most participants eschewed the flowing robes of antiquity for plain white clothes. "If we had known, we would have come in full dress," a worshipper said. In antiquity, the solstice was marked in splendor at major sites such as Delos - birthplace of Apollo - and Delphi, where priests sacrificed animals to the gods in daylong festivals. "We have decided not to include that part in our ceremonies," Peppa said. "We focus on the spiritual aspect." Ellinais has won a court battle for state recognition of the ancient Greek religion and is demanding the government register its offices as a place of worship, a move that could allow the group to perform weddings and other rites. Christianity rose to prominence in Greece in the 4th century A.D. after Roman Emperor Constantine's conversion. Emperor Theodosius wiped out the last vestige of the Olympian gods when he abolished the Olympic Games in A.D. 394. Several isolated pockets of pagan worship lingered as late as the 9th century. Most Greeks are baptized Orthodox Christians, and the church rejects ancient religious practices as pagan. "Many people are afraid to turn up if there are TV cameras at a ceremony, because they can get into trouble with church authorities or even their employers," Peppa said.